Well, it certainly seems as if something has dawned on somebody in Poland. Poland is loosening its visa restrictions on workers from Ukraine, Belarus and Russia in order to ease a labor shortage in the farming and construction sectors, the Labor Ministry said Wednesday. New rules go into effect this Friday, slashing the cost of work visas for citizens from the three former Soviet republics from 900 zlotys (US$330; €240) to 100 zlotys (US$37; €27), and easing bureaucratic restrictions, the deputy minister of labor, Kazimierz Kuberski, told the news agency PAP. Under the new rules, workers would be granted three-month work visas upon presentation of a letter from a Polish employer. "Because of the needs of Polish economy, we decided to open our job market in all sectors," Kuberski said. Despite a jobless rate of about 13 percent, the European Union's highest, Poland is suffering a labor shortage that comes amid a booming economy desperate for construction workers. The labor shortage has been exacerbated by the departure of hundreds of thousands of Poles to wealthier European Union countries for higher wages since the country joined the EU in 2004. Whether this surge signifies permanent placement is clearly an important question to answer but it is important to remember that if the economic situation in the home country deteriorates there could be a strong lock-in factor for the people who are living abroad to stay. From a Polish perspective, I would have thought the most important destinations for emigrants would be those EU countries which decided not to impose special restrictions - namely UK, Ireland and Sweden. In the case of each of the first two we're talking about flows an order of magnitude larger than the ones you say are coming to Denmark. If you look at Poles becoming permanently resident abroad, the numbers don't look too alarming for the country. But if you look at 'temporary' migration, the country is haemorrhaging workers. At the moment the Polish economy overall isn't as hyperactive as some of its neighbours, so things have been happening relatively slowly on the unemployment front (though as you say, there are already localised shortages in booming sectors/regions). But if the Polish economy is to accelerate to a good 'catch-up' pace, demographics are giving the country less and less room for manoeuvre. The big question then will be whether a tightening labour market and rising wages in Poland will encourage enough immigration (of which returning Poles would have to be a major component, I suspect) to avert a hard landing of the kind we're about to see in the Baltics. 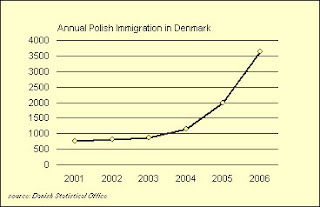 Actually, Norway is getting more Polish immigrants than the rest of the Nordic countries combined (according to the Nordic Council), partially because of our labor shortage but also because we do impose special restrictions - namely that the Poles must get the same salaries as Norwegian workers. Needless, to say, that makes Norway more attractive to Poles. I agree that the big question here is how many will actually stay. Judging by the tendencies here in Norway, I think a large portion of them will stay. The number of people staying here long-term has doubled in the first half of 2007 compared to same period in 2006. That high unemployment number for Poland is likely at least partially due to older workers who spent most of their working life under the Communist system and have been unable to adapt...my understanding is that there are/were many former East Germans in the same boat. Oh yes, the flows to the UK, Ireland and Sweden are definitely bigger than to Denmark. It was just to put it into perspective also I guess from a Danish perspective. Actually, just next to the building where I live there is a whole bunch of Polish construction workers who live in some appartment. Most of it as you are temporary workers which especially is the case for Denmark but temporary has tendency to become permanent sometimes. On the catch-up growth I obviously agree and it will be very important for Poland whether it can expect to see a reversal in the migration flows as some of those temporary workers return. In terms of salaries it is the same thing in Denmark. You see, for a tightly regulated (i.e. governed by two party annual wage negotiations) Danish construction sector when it comes to wages it is not exactly super-duper if Polish workers ship in to work for a fraction of Danish construction workers. This is very important I think and it shows itself in the form of very low participation rates in the older cohorts for some countries. Actually, participation rates are also relatively low in general which suggests that there is indeed some spare capacity to free up here. The problem is of course that the process is moving too fast for many countries to actually implement the reforms which will alleviate this. Agriculture and construction in the UK are now pretty dependent on Poles (and to a lesser extent, Lithuanians etc.) - despite our vast non-working population. Interestingly, according to this story, more than half plan on staying over here. A curious side-effect of this has been to keep inflation low in Britain, while fueling it in Poland.